Pub crawling is a dining experience that all Sydney Food Lovers should try at least once. The ambience and food of local pubs might present something different to that of a standard restaurant, yet like all food dining trends, it’s worth jumping on board to give yourself a taste of what to expect at such a venue. One pub to consider stopping over at if you’ve found yourself in the greater western Sydney region on your pub crawl is Rooty Hill’s Lone Pine Tavern. First time pub crawling? 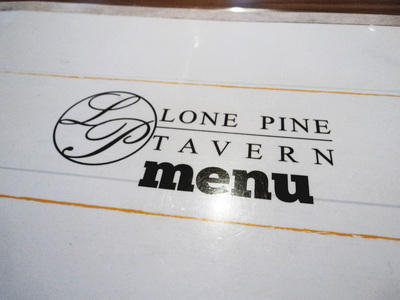 Visit Lone Pine Tavern. The food here at Lone Pine mirrors a typical modern Australian menu, heavy on the categories of grills, burgers and mains comprising of beef, chicken and seafood dishes; as well as a selection of pizza, pasta and risotto. In addition to this, there are kids meals with just the right serving for the little ones, and platters to share between a group. Inside, the dining area is quite large, extending itself outside for extra seating. Group dining is almost encouraged with an extensive amount of large group dining areas available compared to smaller ones, with matching wooden tables and chairs to suit the pub ambience. On top of each table, a laminated menu is already placed in front of you, giving you time to decide what to order without having to make a decision while standing in the line, choosing from the overhead menu. As you place your order at the front counter of the bistro, you’re handed a buzzer that flashes red lights once your order is complete and ready for you to collect. Drinks, however, are ordered at the bar which veers off to the left side of the bistro. Potato Wedges, served with sour cream and sweet chilli. 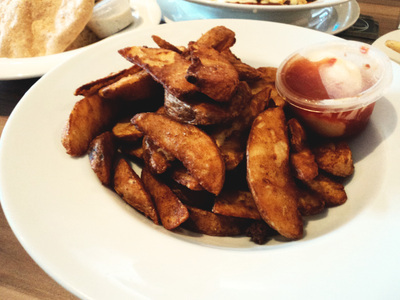 Starting off with the category of light meals and sides, a bowl of Potato Wedges ($7.50) is a good starter if you’re looking for something to snack on, or you're looking for something to share on the side between the group. Served with a small tub of sour cream and sweet chilli, these potato wedges are deliciously golden on the outside and full of fluffy potato on the inside. 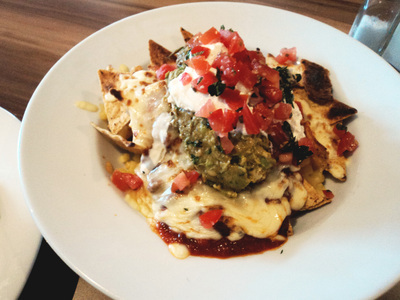 Beef Nachos, served with guacamole, sour cream and salsa. Another side and light meal option is the Beef Nachos ($15.00). Despite being considered a light meal, the serving size of these nachos is very generous, making it a perfect dish for sharing or even having as a main meal. The dish towers with crispy tortilla corn chips underneath moreish layers of melted cheese, beef mince, sour cream, guacamole and salsa. It may appear to be a messy dish, but you’ll be licking your fingers after getting through this mountain of deliciousness. 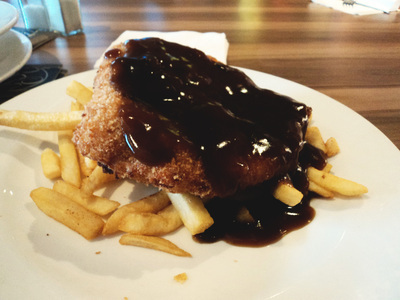 Classic Chicken Schnitzel, served with chips and gravy. If you love your crumbed chicken schnitzel, Lone Pine offers a few varieties of the dish. There is, of course, the option of the classic Chicken Schnitzel ($18.50), served with chunky steak chips, and if you wish, a heaped drizzle of creamy gravy. Along with the Chicken Schnitzel, you can upgrade with a serving of prawns and béarnaise sauce for an extra $3. Mexican Chicken Schnitzel, a little different from a classic schnitzel. For a twist on the classic schnitzel with added flavours and extra ingredients, try yourself a Mexican Chicken Schnitzel ($21.50). Served with steak chips and a bed of mixed salad on the side, this crumbly schnitzel is extra special, topped with familiar Mexican flavours and ingredients such as chilli con carne, jalapeños, cheese, sour cream and Napoli sauce. This is a hearty and heated dish, ideal for the schnitzel lover who is looking for a new spin on a classic main. 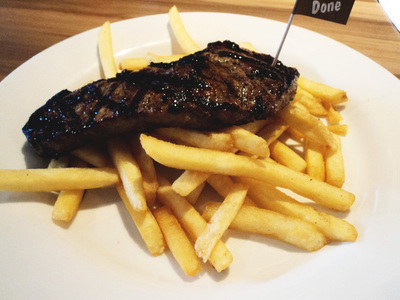 Steak and chips - The Black Angus Sirloin 250g. Of course, a pub food menu isn’t complete without a selection of steaks from the grill. The Black Angus Sirloin ($22.00) weighs in at 250g, beautifully seared on both sides, retaining its juices despite being cooked well done. Accompanying the piece of steak is of course a serving of chunky chips. Lone Pine also highly recommends consuming your steak alongside a Carlton Draught or Cabernet Sauvignon. Chicken, Bacon and Mushroom Risotto, topped with shaved parmesan. 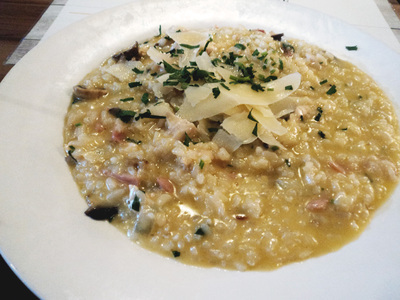 Lastly, a very filling main to consider is the Chicken, Bacon and Mushroom Risotto ($18.00). Filling the bowl completely, the risotto is creamy and indeed buttery, topped off with a garnish of shaved parmesan. With chunky cubes of chicken, slices of mushroom and small, chopped pieces of bacon mixed through the risotto, the dish is full of flavour and texture at each bite. Due to its generous portion, this risotto is definitely a good dish to share between two or a group of people. If the generous servings of food and moderate price already convince you to stop over at Lone Pine for your pub crawl, be sure to visit on a Friday night where meals are 40 per cent off. If you’re lucky, you might even get an advantage on the $5 cocktails to accompany your meal. Nevertheless, whether you visit on a Friday night or any night during the week, you’re bound to find a dish you’ll happily consume, along with a great price, fast service and generous portions. Where: Lone Pine Tavern, 15 Rooty Hill Road South, Rooty Hill NSW. Why: A good place if you're pub crawling for the first time. Large servings and great ambience, especially if you're with a large group of people. 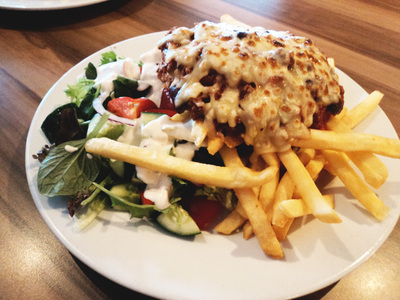 Cost: Light meals and sides from $3.50-$17.00, Mains from $12-$30. Kids meals available. When: Open 7 Day, lunch from 11:30am - 3pm, Dinner from 5pm - 9pm. Friday night is ideal if you want to take advantage of the 40 per cent off meals (limited time only). Good for kids: Kids are welcome into the bistro, but Lone Pine strictly informs families that children are not allowed inside the premises after 9pm.